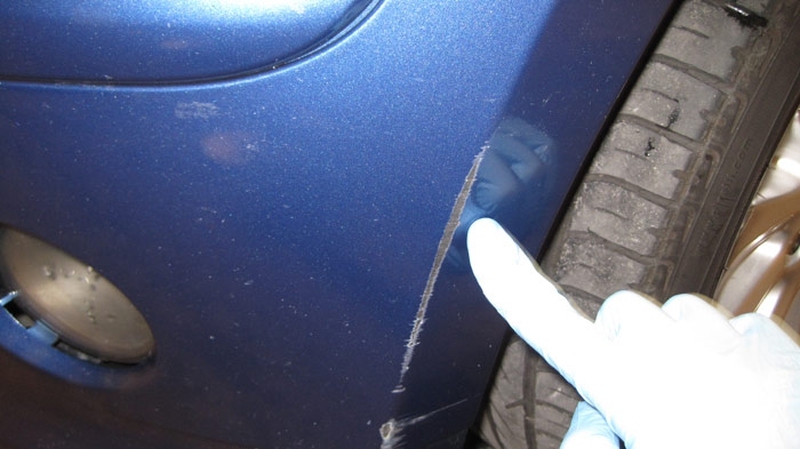 Small scratches and rust spots can detract from your car's appearance and leave your vehicle vulnerable to serious rust damage. Fortunately, with a few supplies and a steady hand, you can fix the paint in these areas and protect your car's exterior. The process is simple, but it helps to follow a few tips to ensure great results.  Identify the damaged area.  Prepare the spot you'll be painting. However, the results of your work will vary greatly depending on the materials and tools you use and how well you perform each step. These tips will help you get the best-looking paint job possible. Driving around, you may have noticed that different automakers use subtly different paint shades within the same color family. For instance, Toyota's Blizzard Pearl isn't quite the same as Mazda's Crystal White Pearl. To get the perfect match for your touch-up paint, you'll need to purchase the exact shade for your vehicle. Keep in mind that paint fades over time, so unless your car is very new and has been well-maintained, the touch-up paint may be slightly brighter than your existing paint job.  Wash and dry your vehicle to make sure all dust and grime are gone.  Park your car in the sun and walk around it slowly, examining it from different angles.  When you see a spot or chip, place a Post-It note or other non-marring sticker near the spot. For deep nicks and scratches, use 80 or 120 grit sandpaper to remove rust. Follow this with finer grits, such as 320 and 1000. For moderate damage, start with 320 grit and move up to 1000 grit. No matter how deep the spot is, it's essential that you keep the sanded area as small as possible. Do not sand the paint around the spot in an attempt to blend the area. Making a stencil or protective covering can help you keep the paint on the damaged area. It's easy to mask off the area around the damage. You just need painter's tape. For small dings and nicks, cut a hole in a little piece of tape and center it over the damaged area. For larger scratches, apply the tape along the edges of the damaged spots. Avoid applying the painter's tape to the rubber gaskets, trip, or windows of your car, since it may be difficult to remove from these areas. After sanding, use a tack cloth to clean the area you'll be painting. Small particles of dust or paint can interfere with your touch-up job and make your results look less than professional. Additionally, make sure you are working where you don't have to worry about dust blowing onto the paint. An open garage or sheltered area is ideal since you will have ventilation but not a direct breeze. Unless your touch-up paint specifically states that it already includes a base, you'll most likely need to apply a layer of primer to your car's surface. This is especially true if you're dealing with rust or have sanded down to bare metal on your car. You can purchase bases, such as the Paint Pen Primer from Automotive Touchup, online and in auto parts stores. Always follow the product instructions for the specific type of base you are using. In general, you'll apply the base in a single, thin layer and allow it to dry. In addition to picking the correct color, you'll also need to choose the best type of paint for your situation. An article on CarsDirect describes the primary kinds of touch-up paint: sprays, paint pens, brush cap paints, and paint kits. The procedure for applying each one is different, and each is suited to specific types of repairs. All these types of paint are available at auto parts stores, touch-up paint retailers, and often, dealerships.  Paint pens: These are small pens that contain touch-up paint. After preparing the surface, you just color over the damaged area and allow it to dry. These work best for small dings and nicks, rather than deep or large areas of damage.  Paint kits: Brush kits contain multiple colors of paint and a small brush for applying it. This is a good way to go if you can't match your paint color perfectly and the damage is very minor. On larger repairs, the imperfect color match will be noticeable.  Brush cap paints: These paints include a brush integrated into the cap of the paint bottle. To use the paint, you delicately apply a thin coat over the damaged area, much like painting your fingernails. Then you allow this to dry and proceed with additional coats as needed. It's best to use this type of paint on spots smaller than a dime.  Spray paints: A bit trickier to use than other options, spray paints give a smoother finish. To use them, you mask off the area around the damage and spray the paint according to the manufacturer's instructions. It's essential to apply light coats to avoid clumping or dripping. This type of paint is good for large scratches. No matter what type of paint you use, you'll need to allow the paint to dry completely between each coat and before applying wax to the car's exterior. Each brand and type will have different drying instructions, and it's important to follow these to get the best results. If it's not raining or snowing, you may be able to dry the paint quickly by taking your car for a spin. The air passing over the surface of your vehicle will speed up the drying process. However, if you have a large area you are painting, it may be better to allow your car to dry in the garage. After the paint has dried completely and cured according to the paint manufacturer's instructions, you should apply a coat of wax to your car to restore its shine and preserve the work you've done. It's important to find out how long you must wait before waxing, however. Some manufacturers suggest waiting 30 days or longer to give the paint time to adhere to the vehicle. Whether you're touching up your paint job in preparation to sell a used car or you just like to keep on top of small areas of damage, it's important to understand the process completely before you get started. Read all the materials that come with the products you select and take the time to choose the correct color and the best tools for the job. Soon, your car will be looking almost as good as new. Server responsed at: 04/22/2019 8:37 p.m.